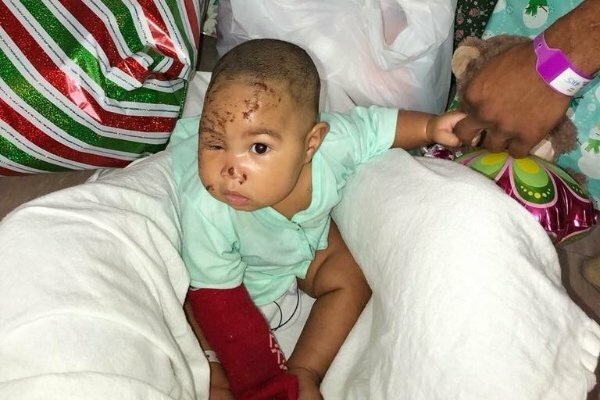 Journi Blake Rodgers recovers at St. Christopher’s Hospital for Children after she was attacked by a raccoon inside her family's North Philadelphia apartment. Last week was a nightmare for the Rodgers family of North Philadelphia. But thanks to overwhelming support during the season of giving, 4-month-old Journi Blake Rodgers will hopefully soon be living in a safer home. Journi was attacked by a raccoon inside her family's apartment last week. Her mother, Ashley Rodgers, found her baby bloodied and scratched up on the floor of a bedroom in their home on the 2100 block of North 22nd Street. To help pay for a new place to live, Rodgers started a GoFundMe page Friday. By Tuesday, the fundraiser's goal of $2,000 had been shattered, with more than $23,000 donated to the family. "Merry Christmas! Thank you all for outpouring of love & support," Rodgers wrote in an update Monday, noting the gifts that had also been donated for Journi. "You all really know how to make a girl feel special. Peace & Blessings to you and your family on this glorious day!" According to media reports, Rodgers heard her baby crying and screaming around 8:30 p.m. Wednesday. She saw a raccoon run down the stairs, and went up to discover Journi apparently dragged off the bed and badly injured. Journi was taken to the hospital for surgery, receiving 64 stitches and a rabies shot, while animal control officers set a trap for the raccoon. Rodgers told CBS3 she spotted the raccoon earlier in the evening of the attack and raised the issue to the landlord. Philadelphia's Department of Licenses and Inspections told the news station that the building does not have a rental license and should not be renting rooms. According to Philly.com, officials have issued a zoning violation to the property owner and ordered the landlord to obtain a rental license and repair damaged walls and windows. Rodgers told the website the money from the fundraiser would be used to find a new home to rent. She said in addition to the online donations, strangers stopped by St. Christopher’s Hospital for Children over the weekend to drop off toys and gifts. Journi was released from the hospital on Christmas Day, according to 6ABC. Doctors expect it will take her about a year to recover, CBS3 previously reported. Rodgers wrote in an earlier update that Journey's condition was improving, as she was "talking and smiling and laughing." "I really appreciate all the help we are getting," she wrote. "I really never expected it."